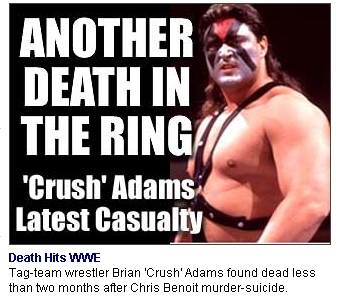 Before I begin, let me express my condolences to the family and friends of Brian Adams, who wrestled under the name "Crush" in World Wrestling Entertainment and under his real name in World Championship Wrestling. First of all, Adams did not die "in the ring". He was found dead in his home by his wife. Adams has not wrestled since 2003, when he suffered a career-ending injury. And what exactly does this have to do with Chris Benoit, who murdered his wife and child before killing himself? Absolutely nothing. Fox News is deliberately sensationalizing the news for more hits. Adams has not been a WWE "star" since 1997, when he was released from his Contract. 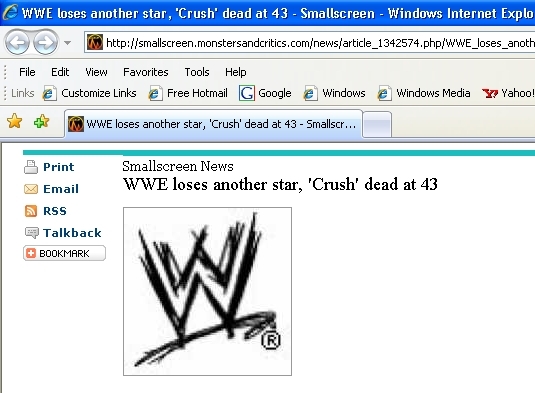 He was with WCW from 1998 through the company's collapse in 2001. Adams had a very short stint with WWE in 2001, but was released after a poor performance at a pay-per-view event. So why is he tied to WWE, considering that he has not been with the company in 6 years and his previous three three years as a featured performer were with WWE's main rival? Is it so hard for the media to actually do some research for a story like this? Professional wrestling is a favorite target of the mainstream media, which often looks down on both the "sport" and wrestling fans. That does not excuse counter-factual "reporting", whether brought about by laziness or bias. If a newspaper, TV network or news Web site wants to do a story on professional wrestling, they should consult people who actually know something about the industry. Those people are not hard to find.